Tim just sent me the initial proof for the emblem overlay. I like it but think we need to talk about it a little before making a comitment to the design. Not sure why just yet but I think we can improve on the current design if we put our minds together! Let me know what you think in the form of a reply. 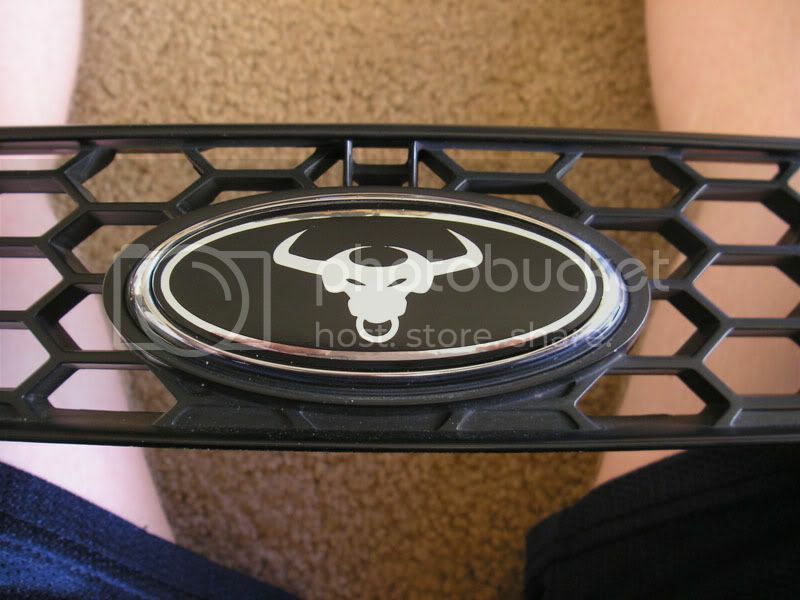 Remember, these will run $20 per set which includes the front emblem overlay, rear, steering wheel, and shipping. As I said before, not a bad price! Maybe its just the picture, but the bull looks a little off-center. Anyways...it's not bad, but what about making the background white, the bull black, and writing "SE" on one side of the head and "TCCA" on the other? Maybe that sounds stupid, idk, just spewing out a few ideas. What grille is that from? a later Gen 4 Taurus? Maybe its just the picture, but the bull looks a little off-center. * Anyways...it's not bad, but what about making the background white, the bull black, and writing "SE" on one side of the head and "TCCA" on the other? * Maybe that sounds stupid, idk, just spewing out a few ideas. What grille is that from? * a later Gen 4 Taurus? I'll check on the centering. I like the ideas you spewed...very nice! Good ones all! The example doesn't look like my Gen IV grille, the emblem is too large. I gave him my measurements and I'm guessing he just used an emblem he had lying around that matched. Measurements would be the same across the board I imagine but to be sure, other model years will need to be measured for accuracy. looks good without any letters! i love the black!! ... its a work in progress. could this fit on a 94 ? im gonna get a couple of these made for me tomorrow in nh. cant wait!! Looking Good... From what I can see its centered. I like the white on black. Just a FYI, in T.V. The Teleprompters are white text on a black background because itÃ¢â‚¬â„¢s easier to see, so I think that its fine the way it is. What about getting some color in there, and maybe even the sites URL.